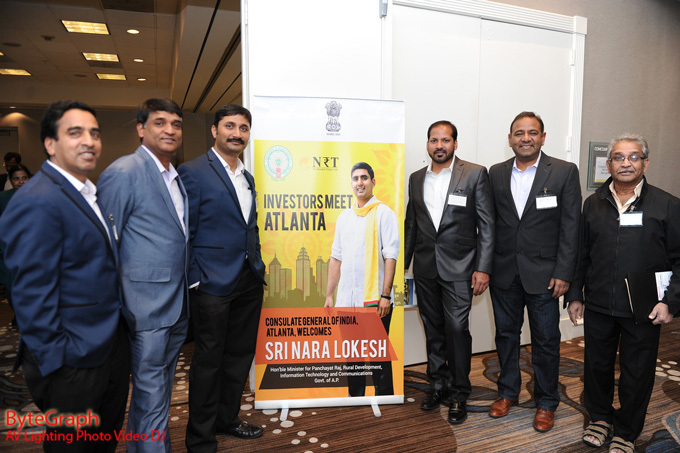 The Consulate General of India – Atlanta hosted an interactive business session with Mr. Nara Lokesh, Hon. 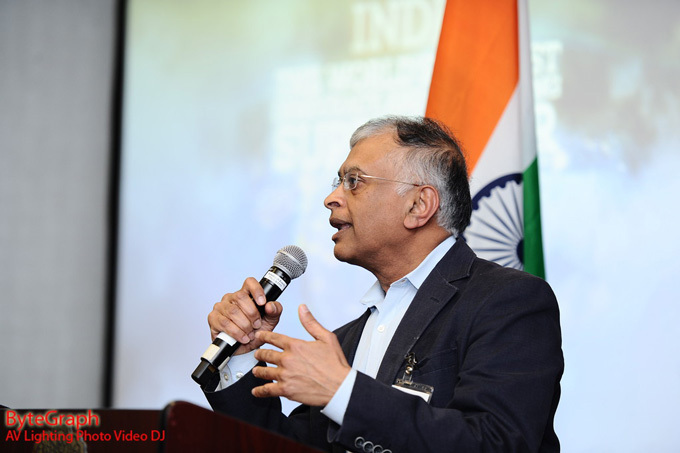 Minister for Information Technology, Electronics & Communication, Panchayat Raj (Rural Governance), and Rural Development for the state of Andhra Pradesh (AP), India, on February 2, 2018 between 6pm to 8pm at the Westin Atlanta Perimeter North in Sandy Springs. The delegation from AP also included Vijayanand Kaveti, Principal Secretary, Department of IT, E&C; Kiran Gutta, Officer on Special Duty (OSD) to Nara Lokesh; Sirish Akula, Additional Director, Andhra Pradesh Economic Development board (APEDB); J. A. Chowdary, Advisor IT; Ravikumar Vemuru, President, Andhra Pradesh NonResident Telugu Society(APNRT); Hari Krishna Prasad, Advisor IT; and Chaitanya Reddy, Public Relations officer. Andhra Pradesh is emerging as a hub for manufacturing, aviation, information technology, food processing, defense, automobiles, textiles, energy, etc. 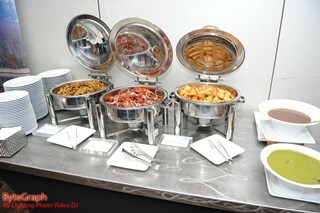 This event was held to share the initiatives and incentives being offered to attract businesses to AP. Around 120 guests comprising of prominent CEOs, senior executives, entrepreneurs, members of academia, and representatives of the business community and business associations attended. Head of Chancery Mr. Shailesh Lakhtakia welcomed the Hon. Minister and the visiting delegation, and Dr. Shirish Akula introduced the Hon. Minister. In his speech, the Hon. Minister gave an overview of the initiatives, the aggressive approach, and the timelines for various targets set for each sector. He addressed the question, ‘Why Andhra Pradesh?’ and explained the unique and high-tech methods adopted by the AP government to speed up the processes. He invited businesses to AP and assured the support by his government in establishing them with the best possible incentives. Questions in the Q&A session covered suitable locations for businesses, cost of establishing and carrying business, infrastructure to support business requirements, and government policies in some specific sectors such as education, healthcare, etc. 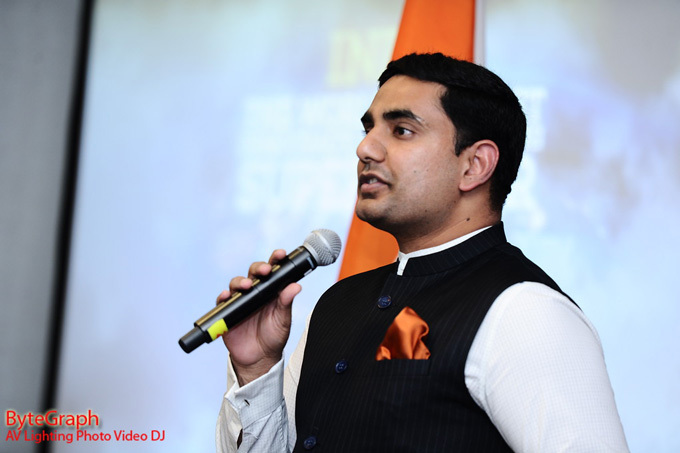 Nara Lokesh was prompt in his replies and also gave examples which would surely boost the confidence of the business community. A healthcare company dealing in artificial intelligence, a Dean of Allied Health Science from a university, and a venture capital company dealing in project finance all expressed their interest in establishing their operations in AP and will submit their proposals shortly. 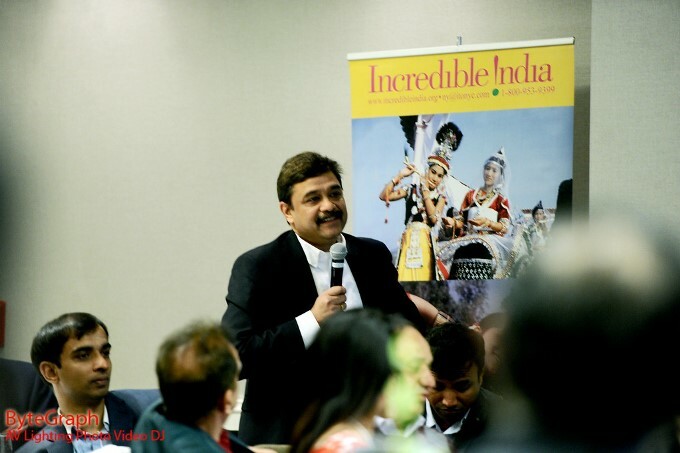 (Right) Mr. C. N. (Madhu) Madhusudan, CEO of VectorSpan and Board Member of TiE – Atlanta gave an overview of various sectors in Atlanta, Georgia and what the business community here is poised for. Excellent pitch by the young, dynamic Cabinet Minister for Information Technology, Panchayati Raj and Rural Development of Andhra Pradesh. Listen to his honest & confident pitch. Exciting to see India’s bright future. We just need few of them like him. He is also the son of Chandrababu Naidu. Of course, the apple doesn't fall far from the tree. Atlanta is impressed! 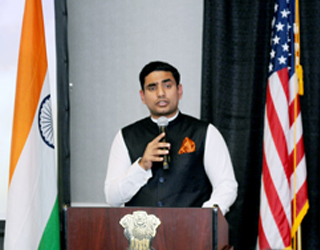 Nara Lokesh was born on 23 January 1983. He is the only son of Nara Chandrababu Naidu, who later become the Chief Minister of Andhra Pradesh, and Bhuvaneswari, and is a grandson of the former Chief Minister N.T. Rama Rao. Lokesh has an MBA from Stanford University Graduate School of Business and Bachelor of Science with specialization in Management Information Systems from Carnegie Mellon University. He was elected as Member of Legislative Council to Andhra Pradesh under the Member of Legislative Assembly quota and swore in on the 30th of March 2017. Lokesh has been one of the Trustees of NTR Memorial Trust (popularly known as NTR Trust) on Healthcare, Education, Skills Enhancement and Disaster Management. Lokesh is designing the Trust’s healthcare program to provide the poor with better access to medical attention, deliver need-based and efficient health care services at the door-step and expand outreach both in rural and urban areas. He is organizing blood banks, health camps (mobile clinics and eye camps). Lokesh oversees the disaster response program of the Trust that operates in times of natural calamities. This involves ensuring speedy and smooth execution of the relief measures through a hierarchy of coordination committees. On 2 June 2014, the north-western portion of Andhra Pradesh was separated to form a new state of Telangana. Andhra Pradesh's longtime capital, Hyderabad, was transferred to Telangana as part of the division. However, in accordance with the Andhra Pradesh Reorganisation Act, 2014, Hyderabad will remain the de jure capital of both Andhra Pradesh and Telangana states for a period of time not exceeding 10 years. The new riverfront de facto capital, Amaravati, is under the jurisdiction of the Andhra Pradesh Capital Region Development Authority (APCRDA).The Gross State Domestic Product (GSDP) of the state in the 2016–2017 financial year at current prices stood at ₹6,800.3 billion (US$110 billion).